Set a course for sustainable seafood, gaze out at the bay and just relax. 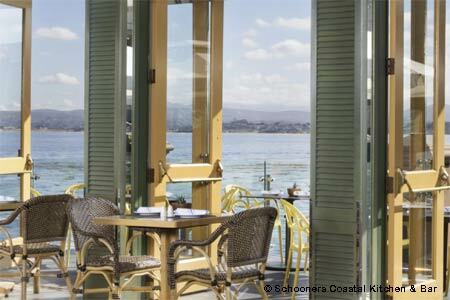 : Breezy and relaxed, Schooners sits right at the water’s edge, and almost every table offers great views. From small bites to appealing desserts, the ambitious and mostly locally-sourced seafood and California menu covers the territory --- and then some. Breakfast favorite huevos rancheros is tasty. Spinach and arugula salad was refreshing, but the artichoke chowder was watery and bland. Happily, the chef’s signature “angry” prawns arrived with complex flavors from a ten-spice rub and just-hot-enough sauce. We didn’t find them angry so much as, well, “fiercely contemplative.” Juicy, nicely-seared scallops were a showstopper. Save room for butterscotch pudding.